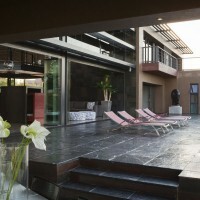 Architect Nico van der Meulen has sent us this house he’s designed in Pretoria, South Africa. 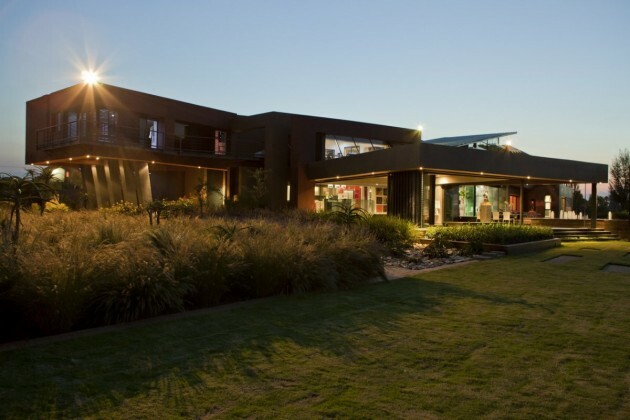 When the owners of this home approached Nico van der Meulen Architects, their brief was simple: “to design a stunning, cutting-edge, contemporary home”. 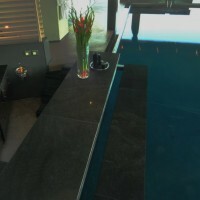 The only absolute requirement was that it had to be visually extraordinary with an indoor swimming pool. 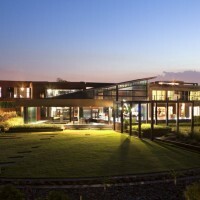 The relaxed attitude of the client and the large site (10 000m²) provided the architects with a golden opportunity to explore the home three-dimensionally with advanced 3D computer software, and fuse the programmatic requirements into the 3D model. 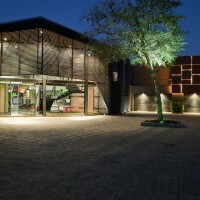 The outcome was a design where form meets function. Enhancing the structure are the incorporation of sun-orientation, circulation, open-plan living areas, view orientation and privacy. 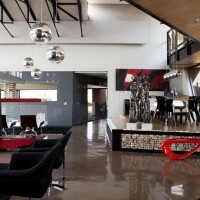 Rudolph van der Meulen, from Nico van der Meulen Architects, explains: “The result is a design where the three dimensionality of the building is celebrated with intersecting planes of steel and glass ‘hovering’ above the solid elements of concrete and plastered brick. 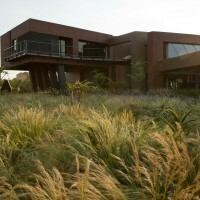 Aluminum louvers are used for sun control and privacy, while creating depth and layering. The ground floor was purposely lifted above the landscape to improve the views of the garden, and to create level differences in the ground floor plane. 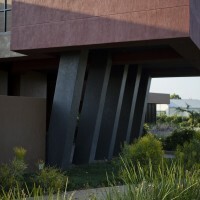 The main bedroom cantilevers over angled concrete columns and reinforces the ‘hovering’ idea”. 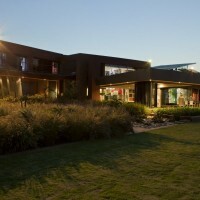 The layout centers around the double volume living and dining area. 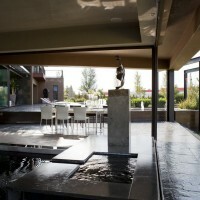 The dining area is placed on a platform to enhance the views towards the garden. The kitchen is more private while at the same time not entirely enclosed (it is open-plan, leading to the indoor pool area). The indoor pool and living area is enclosed with stacking frameless glass doors which gives the inhabitants the opportunity to completely open up the space. Drinks can be conveniently served directly to the pool via an in-water pool bar. 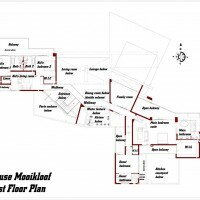 The first floor is split with the children’s bedrooms on the one side, and the main bedroom on the other. The main bedroom has a small private lounge area and is open plan to the bathroom. 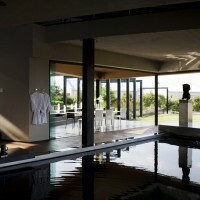 Exterior louvers give privacy for the floor-to-ceiling glass showers. 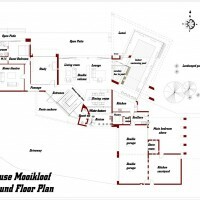 With the exception of the home theatre and the second guest room, which was added later, all rooms are north facing. Even the kitchen that is located behind the indoor pool receives direct north sunlight from the high windows set in the angled roof during winter. The interior design team from M Square Lifestyle Design ensured that finishes and fittings accentuated the architecture of the home. 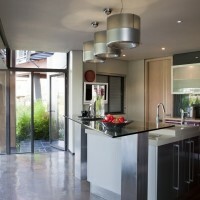 All fittings were specifically designed and made to suit the architecture of the house. 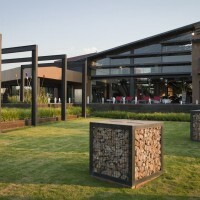 “The interior reflects the exterior with intersecting planes creating points of interest. 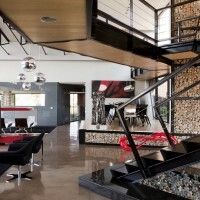 The exposed steel roof trusses, steel I-beams, and the bent steel staircase tie the interior with the exterior and refer to the quasi industrial aesthetic of the home,” explains Phia van der Meulen of M Square Lifestyle Design. 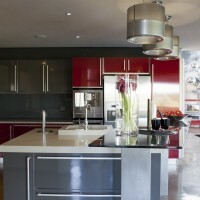 “The color palette was purposefully monochromatic with accents of red. This is drawn from the external finish specification set out by the architect. The idea was to create a holistic edifice, where the boundaries from inside to out are diffused,” adds Phia. 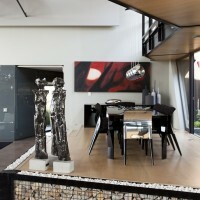 Steel sculptures by Regardt van der Meulen were used to blend with the steel structure. 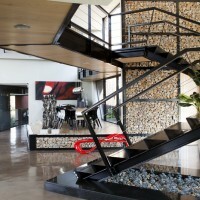 Some of the materials used included polyurethane flooring over concrete floors, mild steel both raw and powder-coated, natural ash timber veneers and a sandstone gabion wall which adds texture as counterpoint to the black polished steel wall in the lounge. 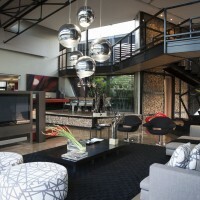 The look was completed with contemporary furniture supplied by M Square Lifestyle Necessities. 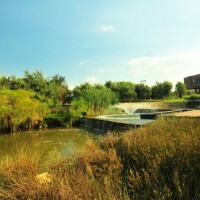 The home fuses aesthetics and functionality and meets the owners’ requirements for cutting-edge design, while fulfilling the lifestyle requirements of a modern South African family. 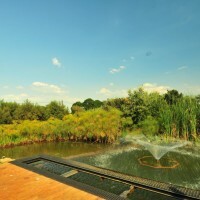 The landscaping was designed to incorporate a large wetlands feature to contain the water seeping out from the rock underlay and this supply an ample source for irrigation of the extensive property. 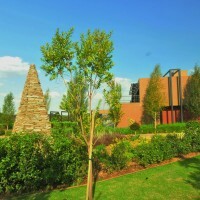 Plants used were all indigenous and adapted to the area, while large sculptures by Anton Smit create visual interest in the landscape.